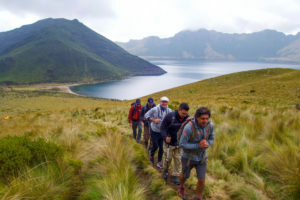 While I have climbed and guided all over the world, I had never visited the high mountain world of Ecuador. Even before the wheels of the airplane touched down, I had an idea of what was to come. The lush, green valleys of the Quito area are surrounded by multiple massive peaks, cloaked in thick blankets of ice and snow. The flight was quick and easy, with no significant time change from the west coast. My friend and our senior guide in South America, Jaime Avila, met me at the airport and soon we were cruising towards downtown Quito and our home for the next couple days. The city sits at almost 10,000’/ 3,048 meters, and the peaks only go up from there. 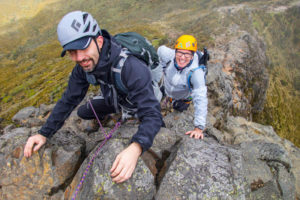 This altitude requires acclimatization, and Quito delivers quite a few attractions that kept us busy while our bodies got used to the thin air. The next day Jaime and I picked up our climbers at the airport and the trip was rolling! 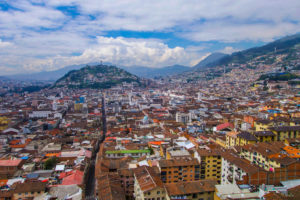 Jaime has lived in Quito his whole life, and he delivers a great tour of the old city. Breathing hard while climbing the towers of the old cathedral reminded us that we still had some work to do before we head to the big mountains! Soon we are ready to climb our first objective, Rucu Pichincha. There is actually a modern gondola that takes us all the way to 13k’! We then made our way up the rolling hills of grass, working up to the peak of Rucu Pichincha. A few of our climbers were feeling adventurous, so we tackled the imposing east ridge. This technical rock climb deposited us on the 15,400’ summit of Rucu, and was a great way to kick off our trip! The descent back to Quito and our well deserved dinner was fast and before I knew it, it was time to head north towards our main objective, Nevado Cayambe. We needed to do a little more acclimatization first though, so before we stopped into the beautiful Hacienda Pinsaqui, we made a quick side trip to the extinct volcano of Mojanda. This volcano blew it’s top a long time ago, leaving a beautiful lake rimmed with craggy ridges and peaks. We hike the peak “Fuya Fuya”, which is comprised of a steep trail through the tall grass, ending on the table top sized summit @ 14k’. This country is really starting to leave an impression on me at this point. The views are out of this world, and we haven’t even started our main objective yet! Soon we find ourselves back in Otavalo, checking into the unbelievable Hacienda Pinsaqui. This historic hacienda was built in the 1790s, and the experience is hard to put in to words. Safe to say we are well rested and ready for Cayambe when we depart the next morning. A one hour drive finds us in the town of Cayambe, at the foot of the mountain. After some last minute grocery shopping, we were off and winding our way up the flanks of the volcano. The road to the Oleas-Berge Refuge gets progressively worse as we drive up the mountain, so we got out and walked the last hour to the hut. Jaime took all our gear in his 4×4, so we had a pleasant hike that further acclimatized us to our new home for the next couple of days. The Refugio sits at 15,000’, right at the edge of a massive abyss that looks over the huge glaciers that cascade down the flanks of Cayambe. This building is a welcome home in thin air, complete with bedrooms, fully staffed kitchen and a buzzing atmosphere of climbers getting ready to make their summit bids, and also some with the tired look of satisfaction of just having descended from the summit that day. We spent the next day up on the glacier, reviewing the skills and techniques that allow us to move through the world of ice that makes up the upper mountain. Jaime, Topo and myself assisted our team in readying all our equipment and after an excellent hot meal, we were in bed early. I felt the familiar anticipation that always comes before a big climb, my mind methodically checked over all my preparation, my equipment, and how the team is feeling. I was confident and stoked for the morning, I knew it would come quickly. 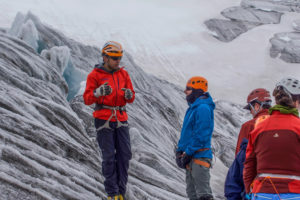 For more information on our Ecuador Climbing School and other international expeditions check out our website and for any questions call the office at 877-873-5376 or send an email to info@alpenglowexpeditions.com.